If you have crooked, widely spaced, or misaligned teeth, you may think traditional braces are the only way to fix your smile. But Dr. Salivonchik is giving patients of Allentown, Coplay and surrounding cities another choice—Invisalign clear braces. FDA-approved and virtually invisible, Invisalign lets you straighten your teeth while also keeping your professional image intact. And because Invisalign aligners are removable, you don’t have to worry about changing your life or your eating habits to fit your braces. Instead, you can look forward to comfort and convenience as you improve your appearance. Your treatment starts with a thorough tooth-by-tooth exam by Dr. Salivonchik. This gives us a chance to assess exactly what your needs are. Then, we’ll take an impression of your teeth and send it off to Invisalign’s lab. 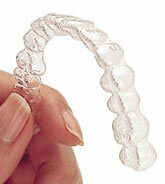 In just a short time, your custom-made acrylic aligners will be ready to wear. Simply slip them on and wear each pair each pair for two weeks. In all, treatment takes between one and two years. During that time, your aligners are exerting gentle yet continuous pressure on your teeth, shifting them in to place gradually. And because your aligners are removable, you don’t have to spend that time worrying about your social calendar. Just take your clear braces out to eat, brush, or for important social events and just put them back on when you’re done. If you want a straighter smile, but don’t want traditional braces, we can help. Our office serves patients in Coplay, Allentown, Bethlehem, Easton, The Poconos and surrounding cities. Call us today to find out more about Invisalign clear braces or to set up an appointment with Dr. Salivonchik.